geek with curves: Legoland Gets Star Wars! Back in the day, few things made me happier than my bucket of random Legos and accompanying huge base plate. Sometime during that pesky growing up business, my Legos were lost or given away to a cousin or sold at a yard sale. I forgot what was I missing until I was recently gifted a set of Star Wars Legos. It's a magic combination. I assembled it in no time and immediately needed more Legos in my life. The pile has grown since then, and I'm even making a base pad to fit my coffee table and stocking a new bucket of labels. So, imagine my happiness when I heard today that Legoland California is getting a whole Star Wars area! I'd considered going to Legoland just on the principle that the gift shops have to be awesome. The news about Star Wars seals the deal though. I will definitely be going, and I know that I'm not the only fan they'll draw in. They're not just adding a few figures to their current collection either. No - it will be a whole area in the kid's land (Miniland). 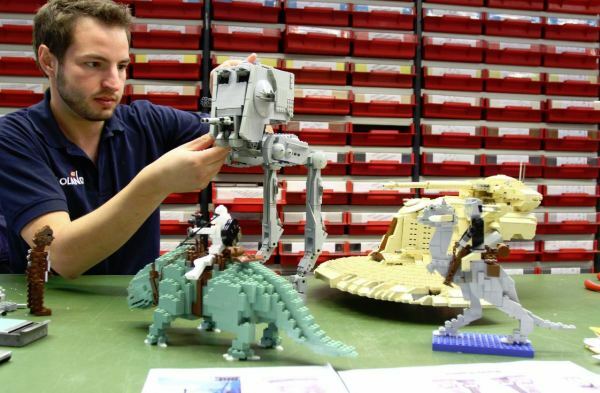 One and a half million glorious Lego bricks dedicated to Star Wars. Go ahead and drool, I'll wait. In addition to life-size Lego models of Chewbacca, R2-D2 and Darth Vader, visitors can walk through seven scenes from the movies and Clone Wars complete with special effects. A team of eight model designers and two animation electricians in Germany has been working for over a year with Lucasfilm on the 1:20 scale models. Once in the Carlsbad location, master builders will bring the scenes to life. There will be one scene per film and one for the animated series. The attractions will feature Naboo, Geonosis, Kashyyyk, Mustafar, Tatooine, Hoth, Endor, and Christophis. I would tell you what scene goes with what film, but I know I don't really need too. You can read more details about the sets and characters featured in each scene here. The new Star Wars addition opens on March 31. I'll see you there! WOW!! this makes me wish i lived close to legoland SO BAD! I am now officially geeking out.